"This is a great easy recipe for anyone to try with just basic ingredients. 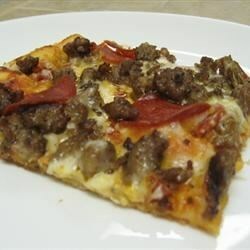 If you love a good thin crust that still has a nice chew to it, this recipe is for you." Pour the warm water into the pan of the bread machine, and add the flour on top of the water. Sprinkle with salt and sugar, and top with the yeast. Set the machine on the dough setting, and push the start button. When the machine signals that the dough is finished, transfer to a well-floured work surface. Roll or stretch the dough out into thin crust about 14 inches across. Leave dough thick at the edge. Place the dough onto a 14-inch pizza baking sheet, and brush the dough with the olive oil. Bake in preheated oven for 5 minutes before removing to top with desired ingredients for final baking. pretty good, not the kind of crispy bottom i was looking for, but it was very easy to make and the dough was easy to work with! Didn't work, plain and simple. I followed the measurements exactly, ran the dough cycle on my bread machine, and ended up with a sticky, wet mess that was completely unusable.